​​​​​​​The Magician/Mentalist introduces ten cards to his spectators. Each card is printed with the image of a ‘Lucky Charm’ items considered to bring good luck. An envelope containing a prediction is placed in full view or handed to a spectator to keep hold of. 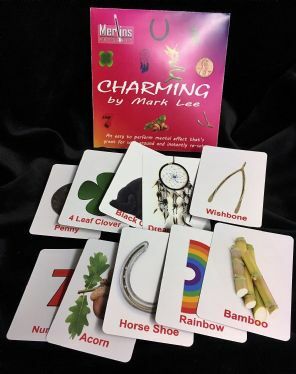 The ten charm cards are dealt through to allow the spectators to see all the different images. A spectator is asked to merely think of any number from one to ten (inclusive). The charm cards are dealt through again, this time asking the spectator to remember the image which lands at his thought of number.